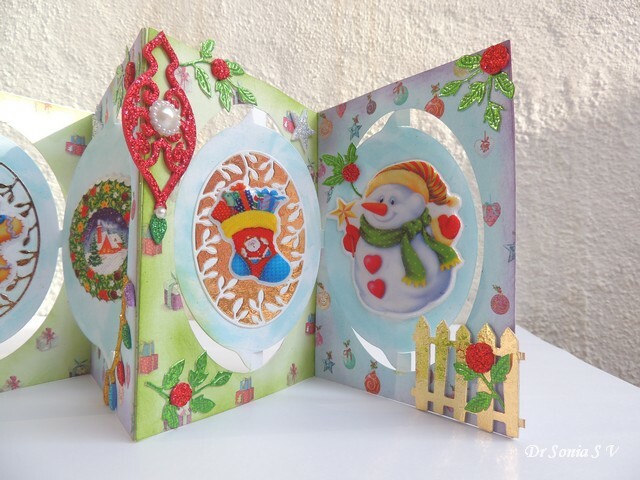 Hi friends sharing another Christmas Accordion Pop Up Card similar to the one I shared yesterday and made with Karen Burniston's die. 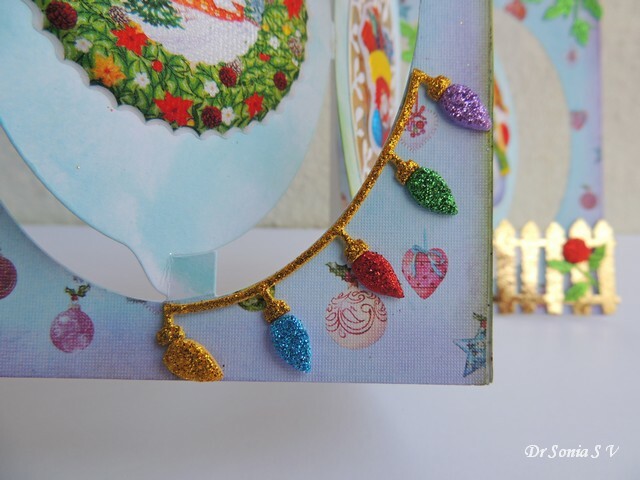 This one has all the festive colors and is all glittery and decked up for Christmas! 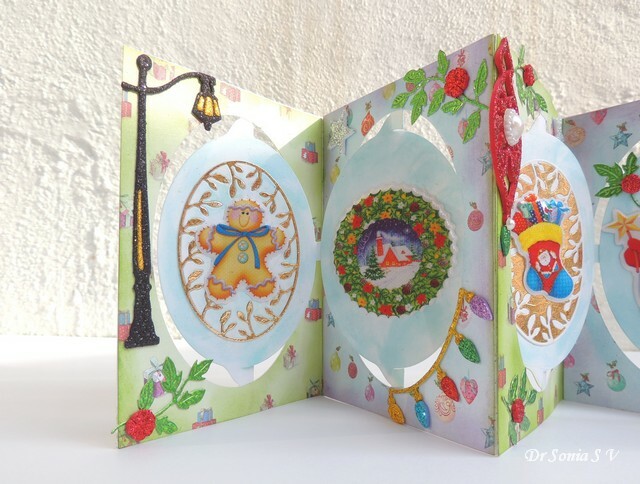 My first panel has a glittery lamp post and a golden Gingerbread man framed in a golden oval frame . 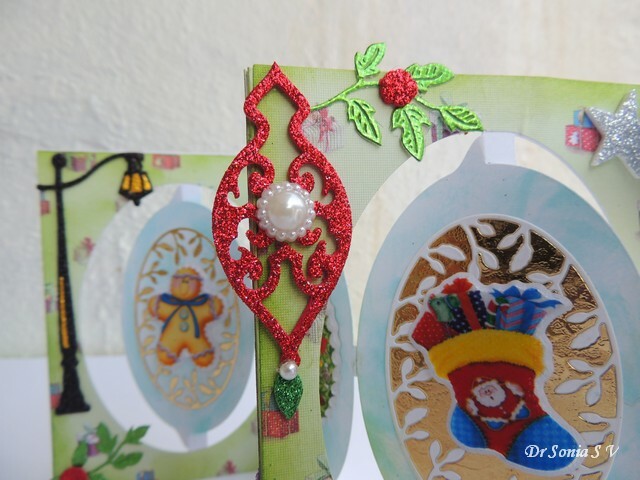 The 2nd panel has a festive wreath featuring a wintry cottage and festive lights. I used a Cheery Lynn die to cut glittery lights from glitter foam. 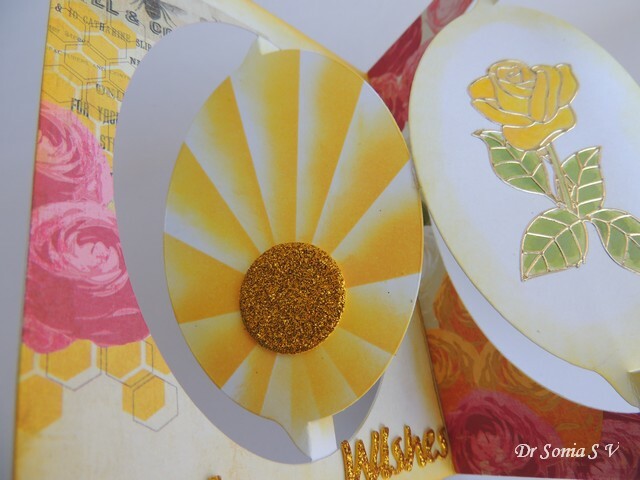 Since my card has many bright and colorful elements I used Distress Inks to tone down the pattern paper and the central ovals. The last 2 panels feature a cute snowman and a stocking full of presents. 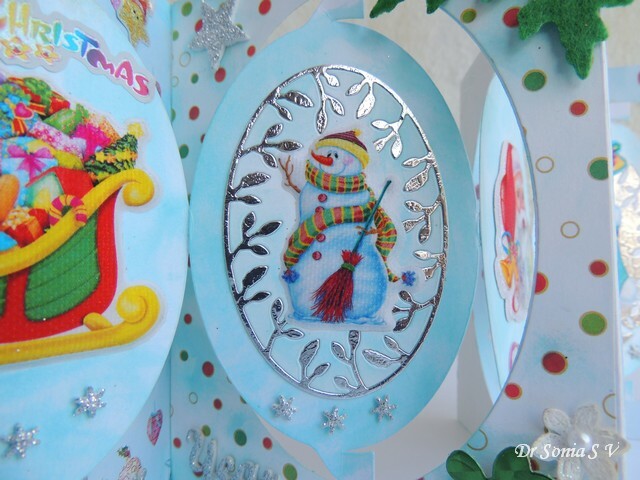 I used a Spellbinders die to cut a glittering foam ornament. 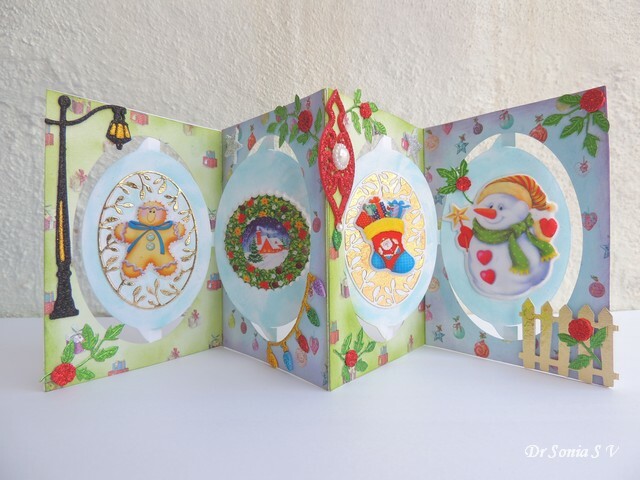 The stocking is framed in a golden Poppy Stamps oval frame. 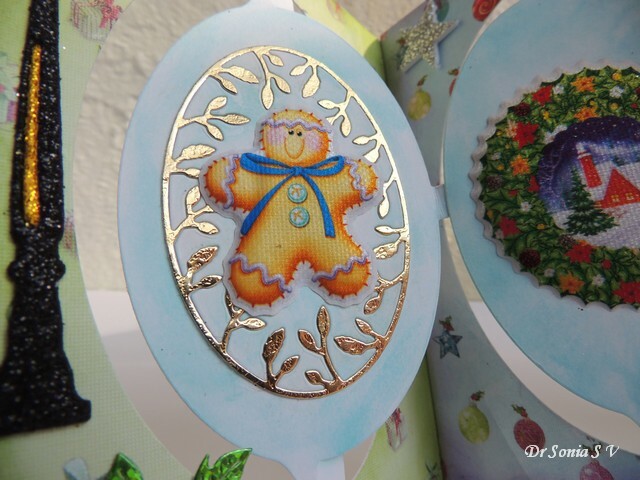 Yes there is a lot of gold and glitter in this one but I guess in a festive card we do have license to add all the glitter and gold we fancy!! 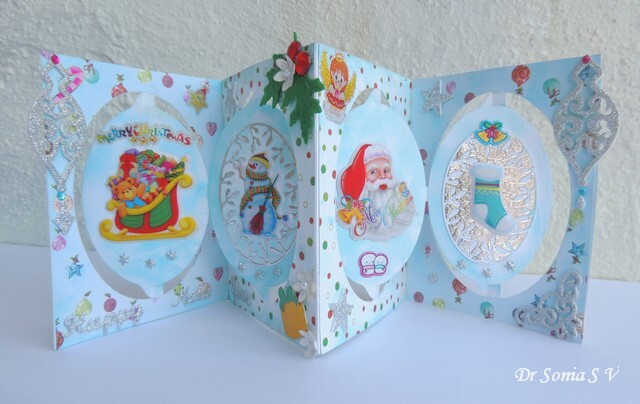 I love traditional Christmas images and Pop Up Cards and so made an Accordion Pop Up Card with a sleigh , a snowman and Santa plus lot of other little traditional Christmas symbols! 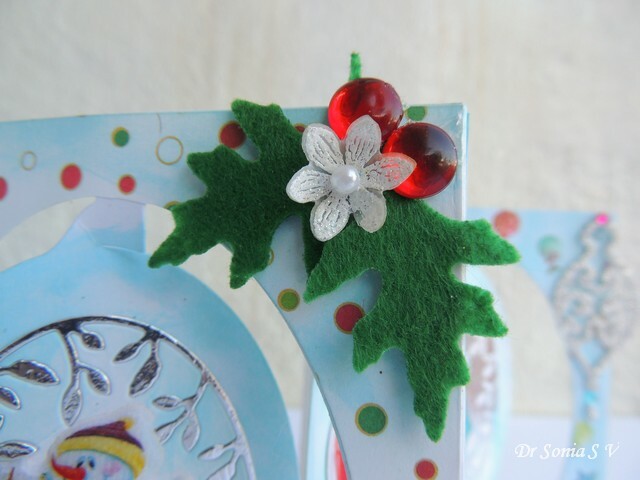 I hardly ever make cards without flowers and so couldn't resist adding a heat embossed tiny vellum flower to felt leaves and some rhinestone "berries"! 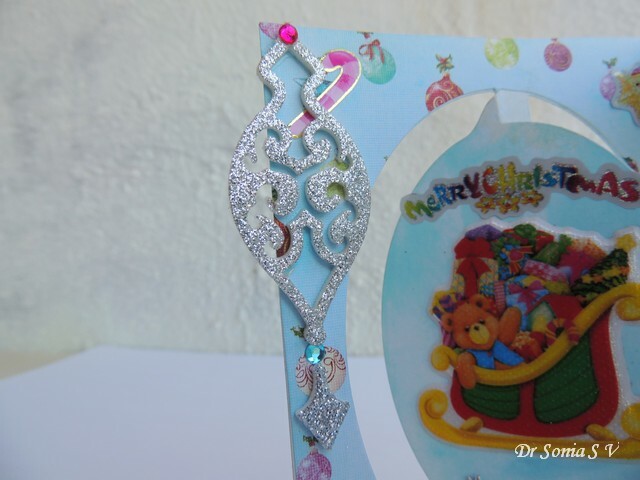 Cut a festive ornament from silver glitter foam and dressed it up with a few rhinestone crystals.The paper I used on the frame of my card also has lots of tiny Christmas ornaments! 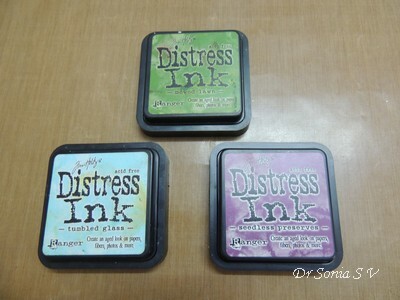 I used tumbled glass Distress Ink on all the ovals and the frames to bring about a coherence of the different panels. 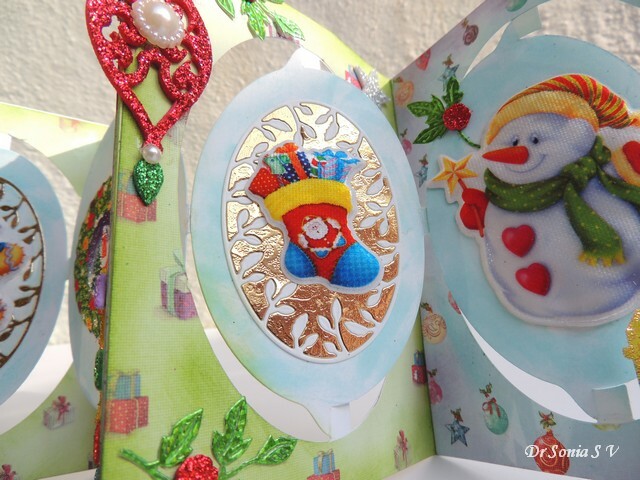 All the focal images used in this card are stickers...yes I love stickers! 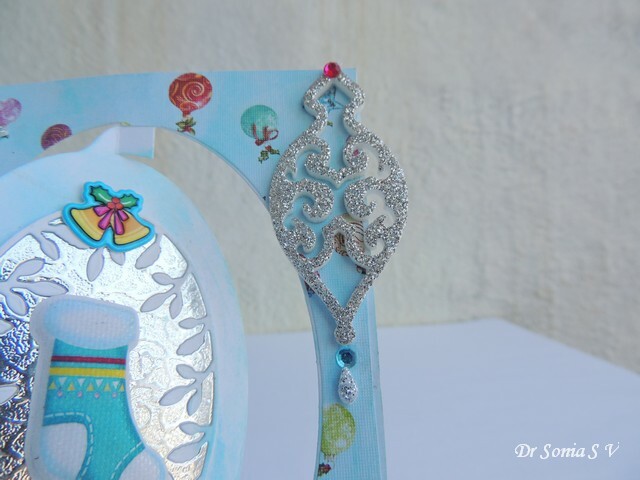 I used the same Poppy Stamps Emory Oval frame die to frame the Stocking only this time I made the center silver and the edges white.I love the sheer beauty and delicacy of this poppy stamps die! 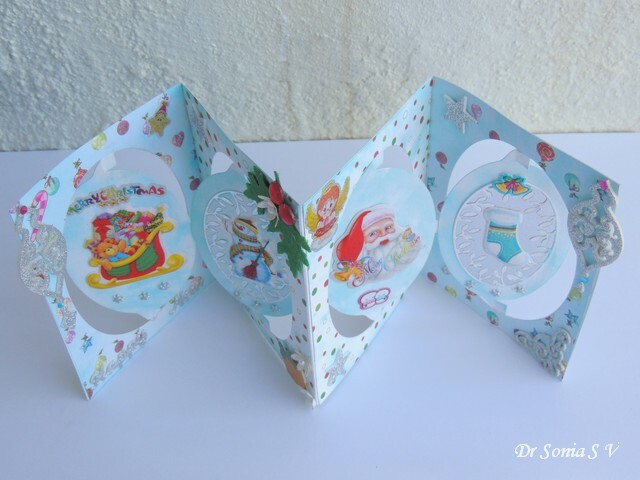 And this is how the Accordion Card looks from above with the swinging pop up ovals and since I didnt add any bulky embellishments this card folds perfectly flat for mailing! 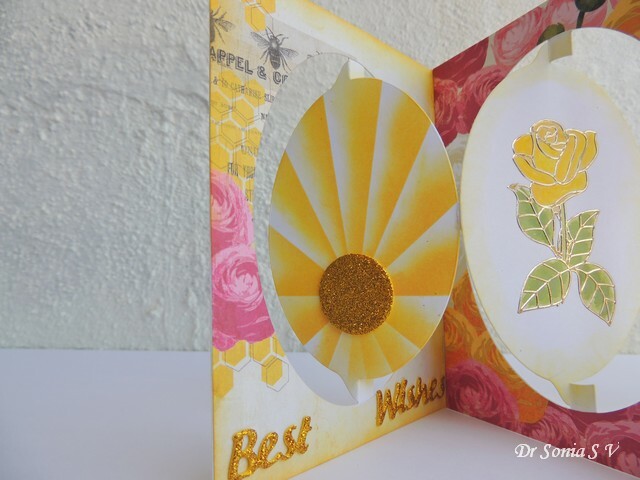 Hi friends,sharing a flat folding Accordion Pop Up Card featuring an inked sunburst and some pretty flowers. 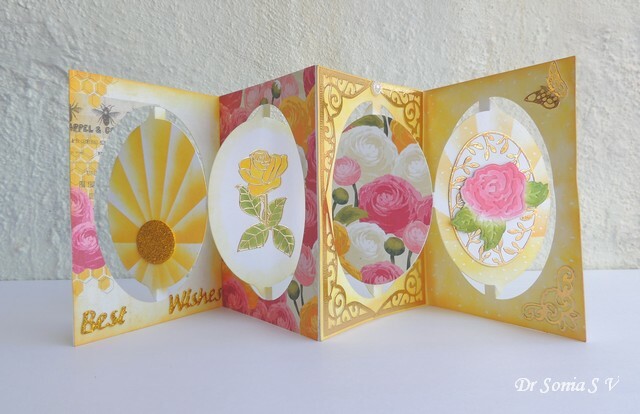 My first Sun beam Card made with this technique had a bit of shoddy inking, this one turned out much neater! 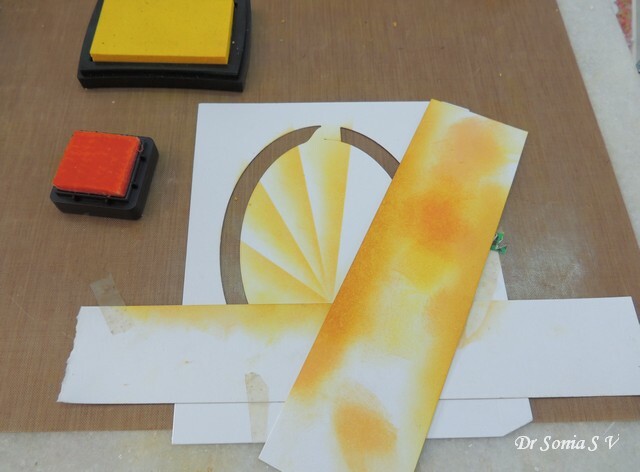 I added a golden glitter foam sun to the center of the sun beam. 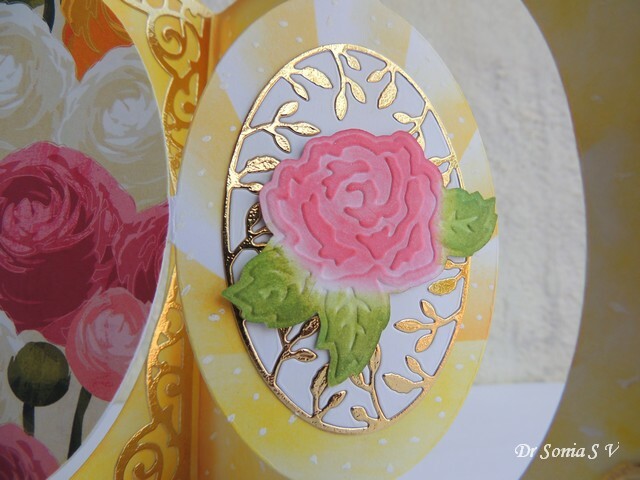 The beautiful rose is a golden peel off sticker I applied to my central oval and water-colored using distress inks and watercolor pencils. 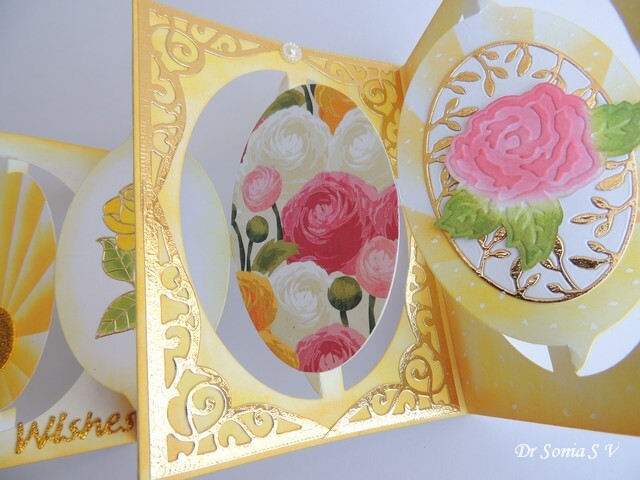 I used a gorgeous rose themed paper on the center of one panel and dressed up the frame with Spellbinders labels 25. Made the background using Distress Inks and dotting with a white correction pen! 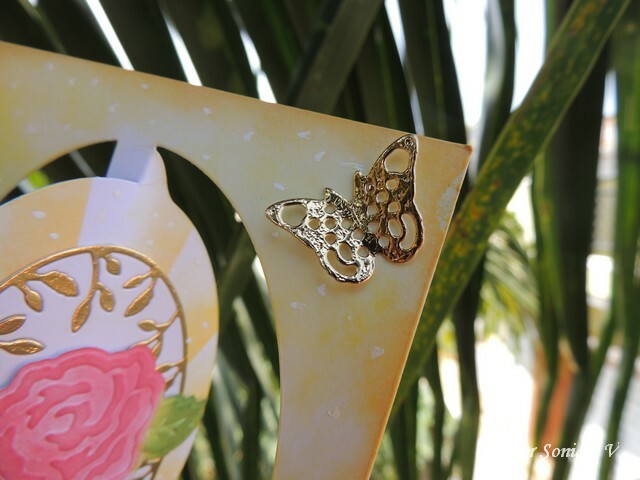 Added a favorite Cheery Lynn butterfly cut from metallic gold paper. 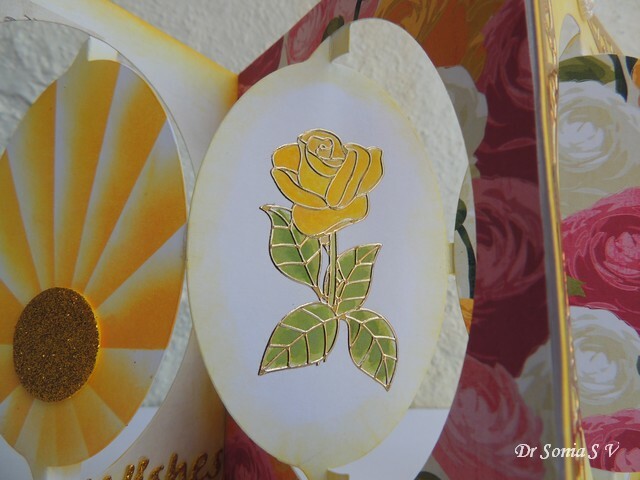 On my 4th card panel I created a sunbeam background and layered a golden leafy oval frame die cut on it and added an embossed rose . 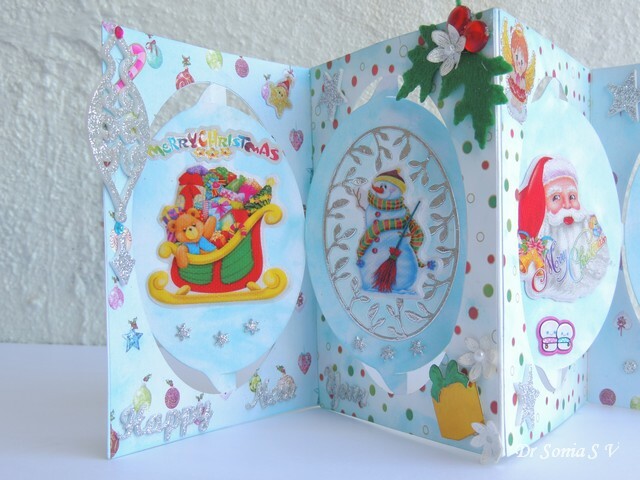 I hope you like my cheerful card. 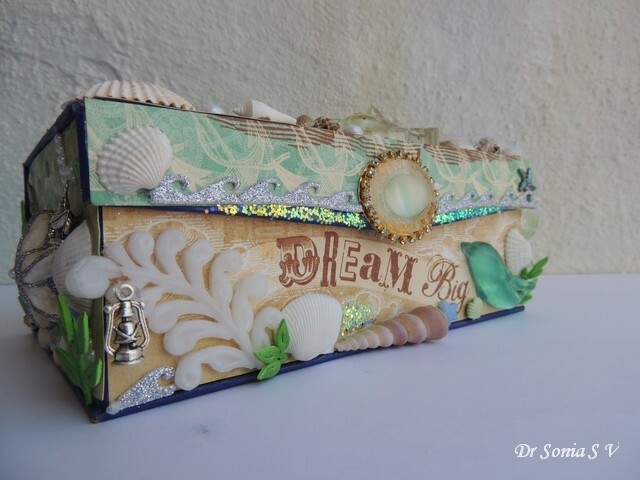 Hi friends sharing a vintage Ocean themed Altered Box in which I have incorporated dozens of crafty techniques and products. Its a long post so just scroll down flipping through the photos and pause to read about any part you find interesting! Would love to have your comments though! 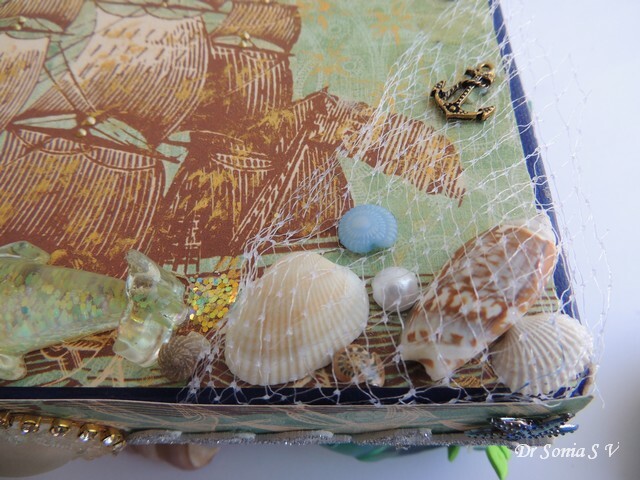 I used a gorgeous paper from DCWV Ciao Bella stack that had a beautiful image of a vintage ship sailing and used it to line my box. Used the dry brush technique to put shiny acrylic gold paint splats all over the paper. 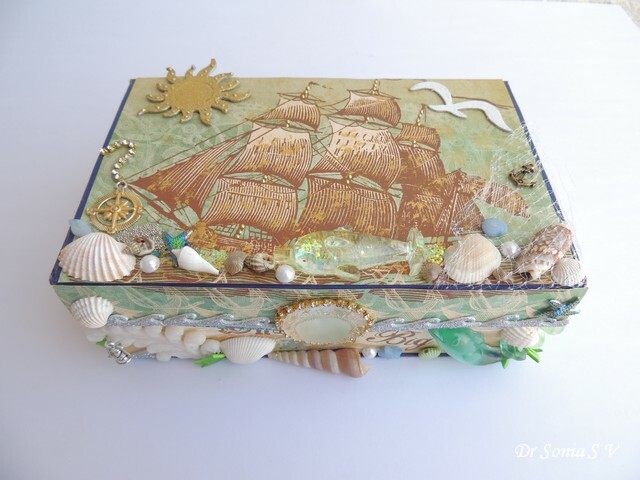 The water droplets you see all over my box are actually made of resin...and no I didnt purposely go ahead and make them but they are a result of resin spills during my resin experiments...they do look charming dont they? 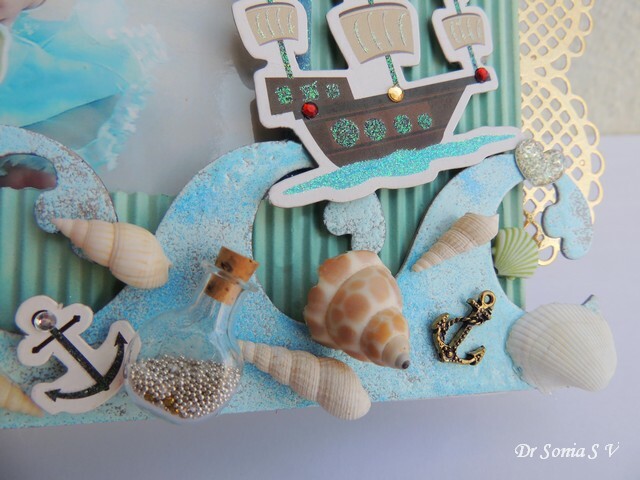 What is the sea with out the sun?!! 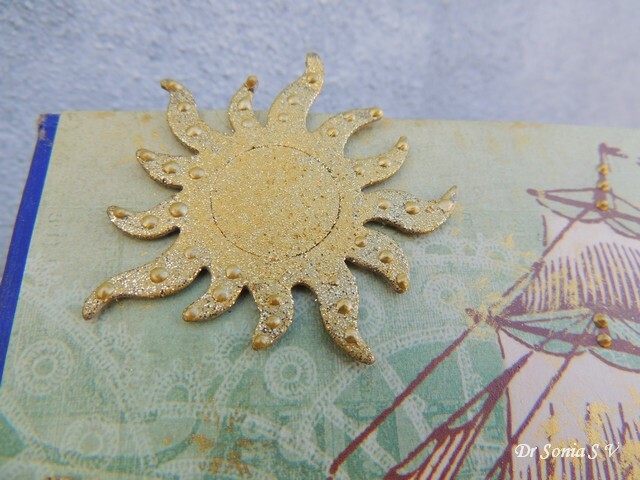 I altered a chipboard sun with gold embossing powder and gave a partial dabbing with acrylic gold paint and a few drops of golden liquid pearls. The other corner of the box lid has a net [ recycled vegetable packaging! 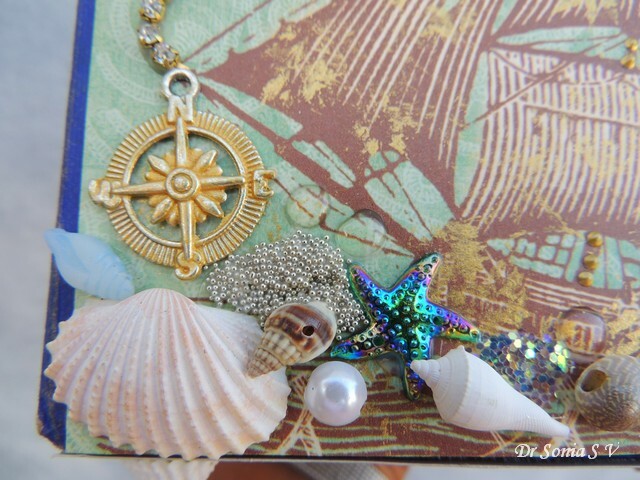 ], more favorites from my shell collection , a shell shaped bead [from my daughter's bead jewelry making set] and a golden anchor. 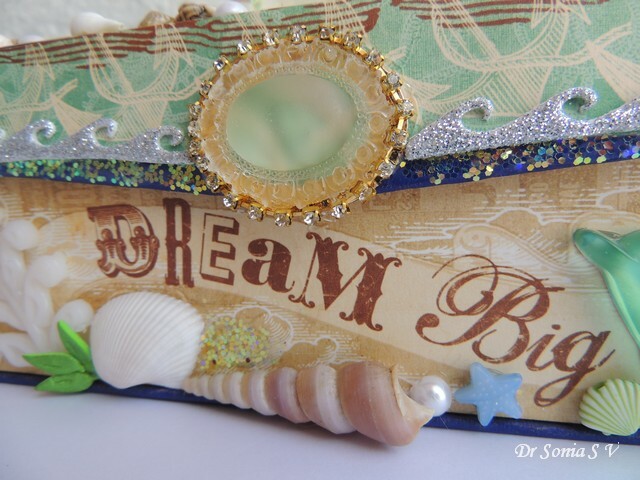 On the front of the box is the beautiful and apt sentiment " Dream Big" from the same paper collection. 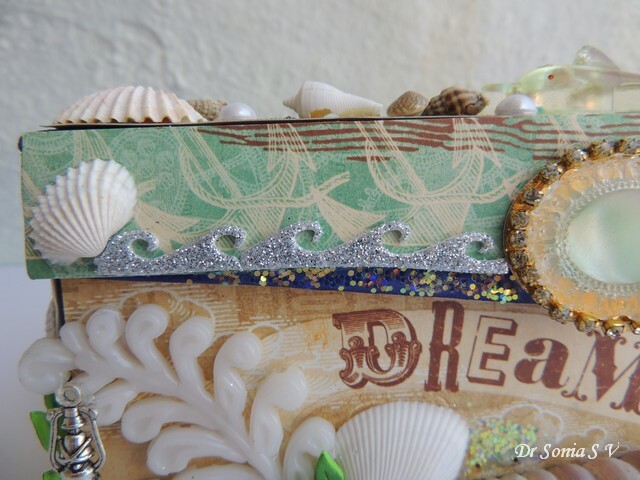 I think the oceans are so dreamy and inspiring and must have inspired many souls over the ages! 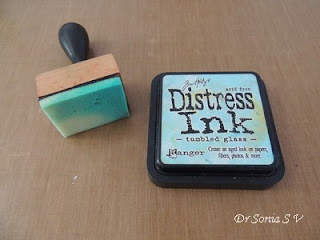 I made this beautiful oval resin embellishment in clear resin and placed a turquoise oval surrounded by golden paper behind it to give it a multicolored hue! Wrapped a golden chain of rhinestone crystals around it to make it shimmer even more! 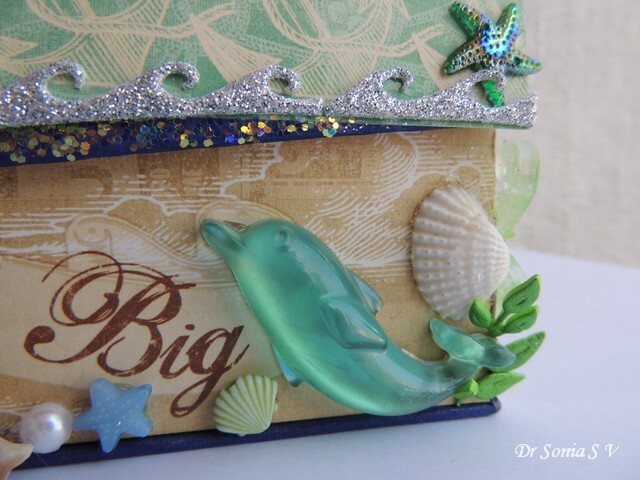 The shiny silver waves are cut from glitter foam using a Cheery Lynn die and I added chunky blue glitter along the edge of the lid. 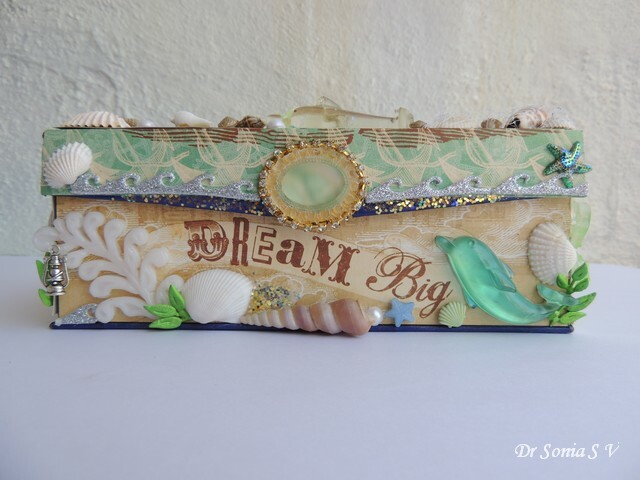 The big pearly white "seaweed" was made using this mold and white glue sticks! And yes hung a little lamp to shed light during stormy dark nights ! 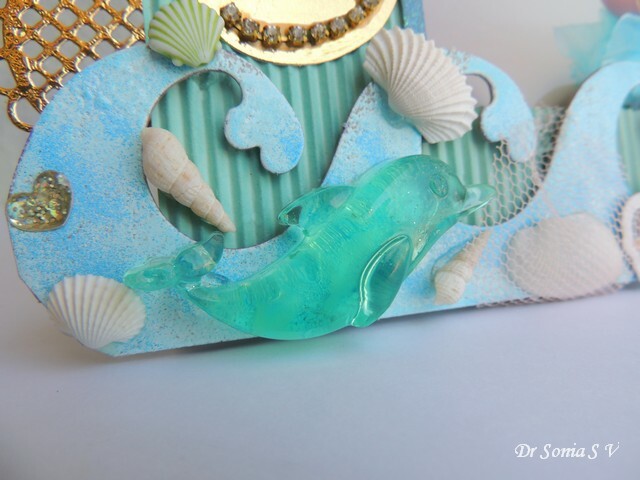 And my favorite Resin Dolphin which you saw in my Ocean Photo frame too! 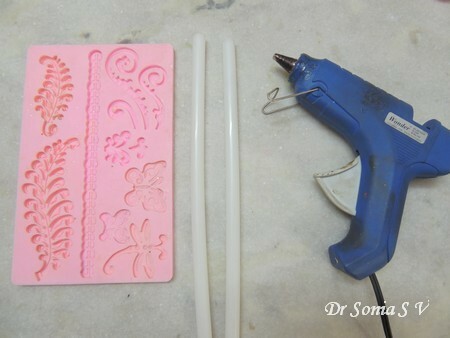 I made all the Resin embellishments in this project using local Resin [seen in the 2 big cans in the photo above] and silicon moulds [meant for chocolates!]. 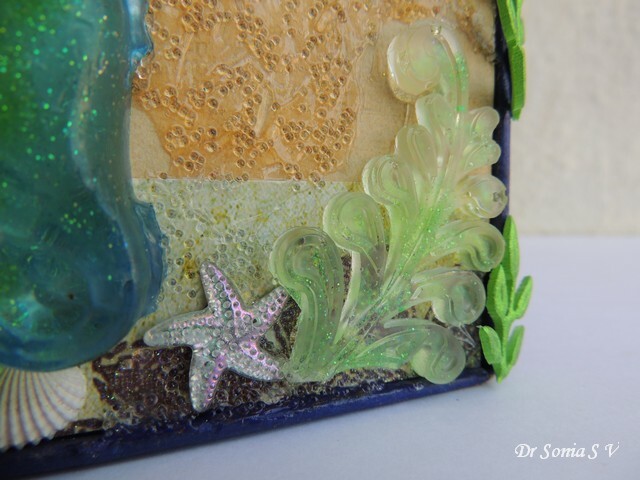 I have been experimenting with resin for some time now and its so addictive to make all the fun resin embellishments right at home. Will share a tips and tutorial post soon! This is the side of the box and stars a clay star fish I had made earlier and salvaged from our fish tank decoration project . The shimmering green leaves were cut from textured foam [ amazing what treasures you can get on a trip to the local market !] 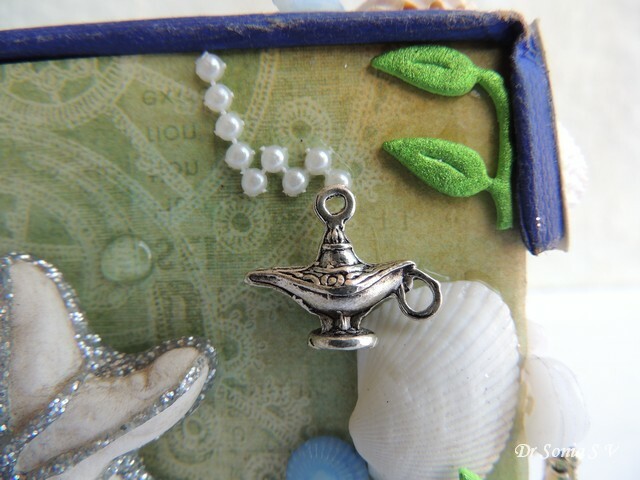 using Cheery Lynn olive branch and I hung the magic lamp from a piece of pearl mat! 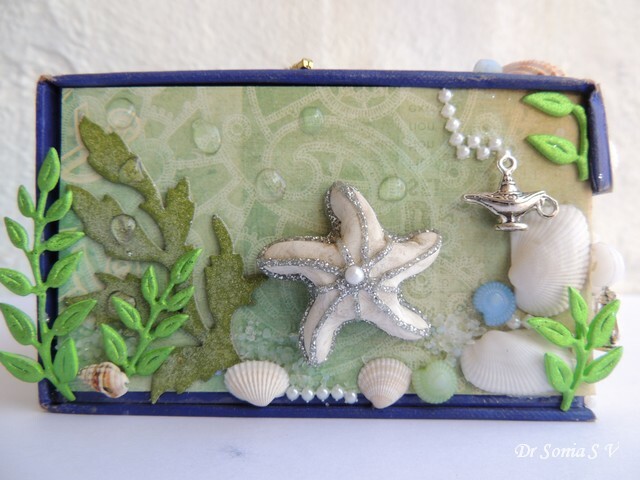 I somehow always associate the sea with a bit of magic! 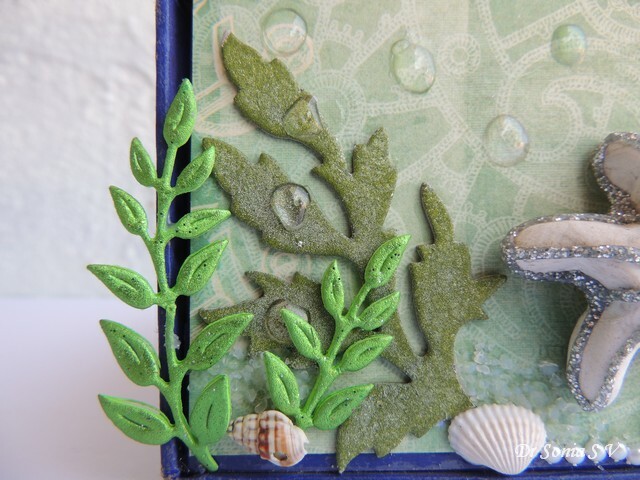 The sea weed is heat embossed chipboard and Cheery Lynn foam die cuts. All the glistening water droplets are resin drops! 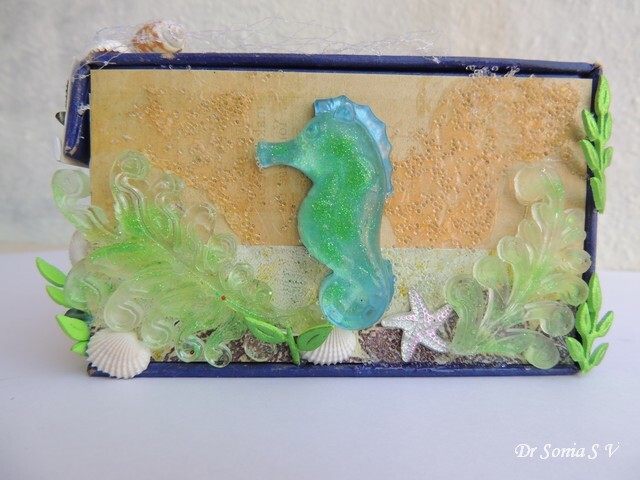 And that is the other side of the with a big Resin sea horse surrounded by resin sea weeds on a textured background ! 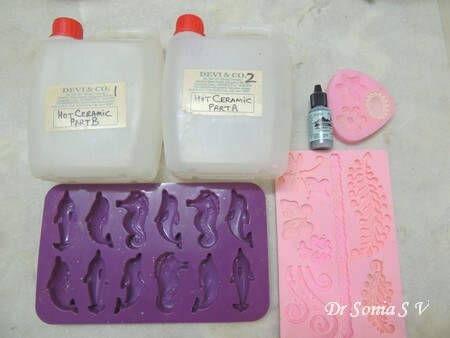 When I made the Resin sea horse and seaweeds seen here I added a bit of glitter before the resin set in the mould ! 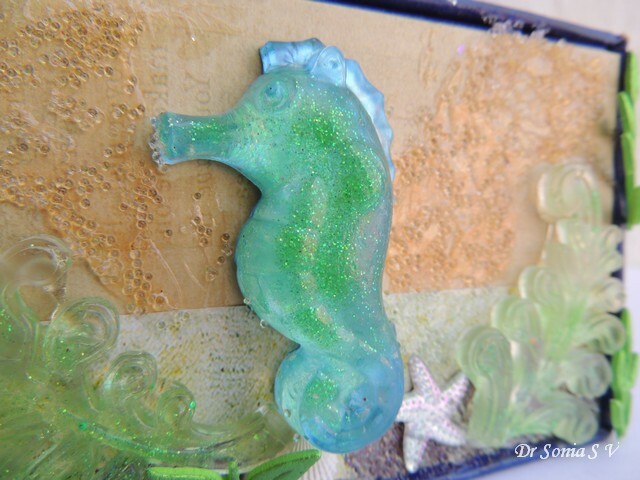 I added pearly blue acrylic paint on parts of the base of the seahorse so that the sea horse looks blue - green and shimmers when you look at it from different directions! 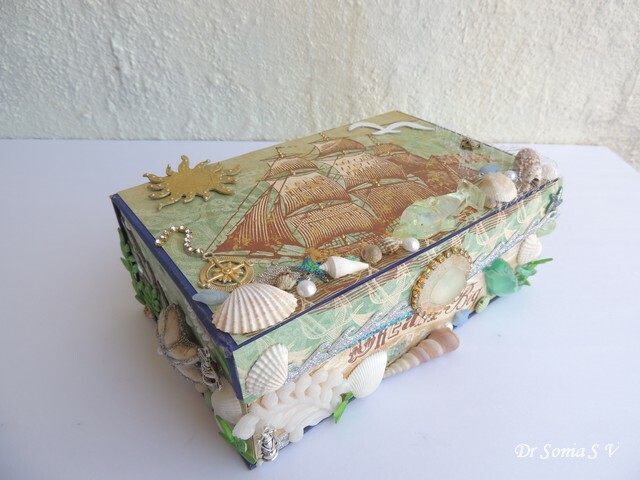 I hope you like my altered Ocean themed Box. 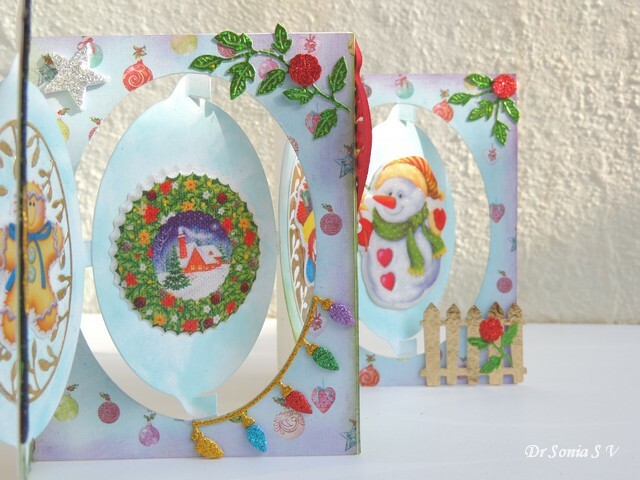 I love making photo-frames by recycling old desktop calendars and have made and gifted so many over the years...they are a big hit with the recipients and so much fun to make too! 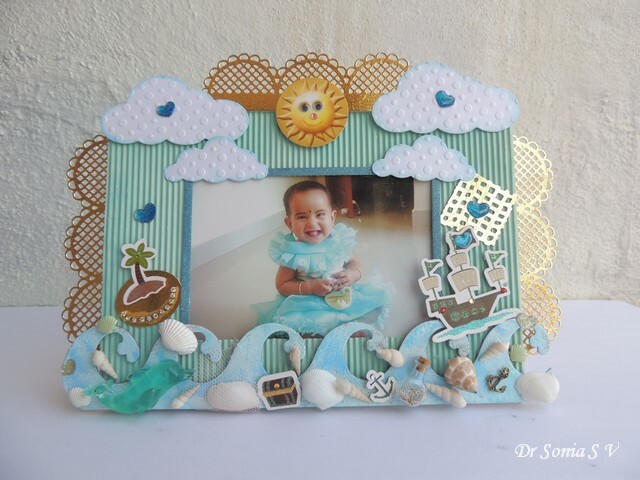 We are planning a short holiday to the beach soon and I guess that is what made me choose this theme for the Photo-frame. And yes the photo is of my daughter in the toothless grin stage at 8 months ! I cut out the sun image from a Tarot card set I had bought during a phase I was fascinated with the numerology, astrology etc etc! To increase the cuteness quotient I added googly eyes , a pink rhinestone nose and a big smile! 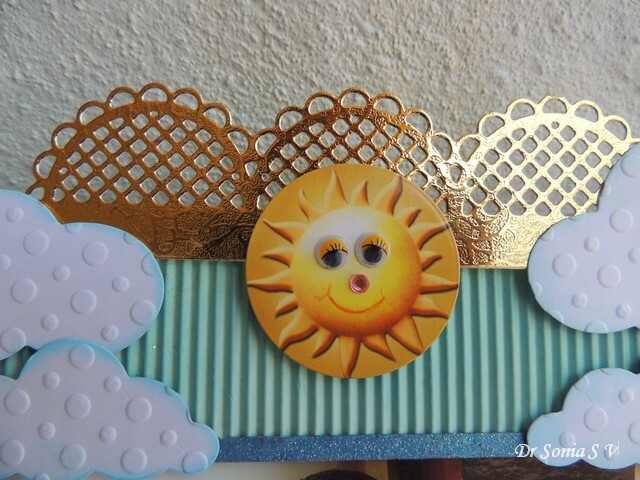 The golden backdrop is a Joy Crafts Lace die cut which I added to the sides of the photo-frame too. 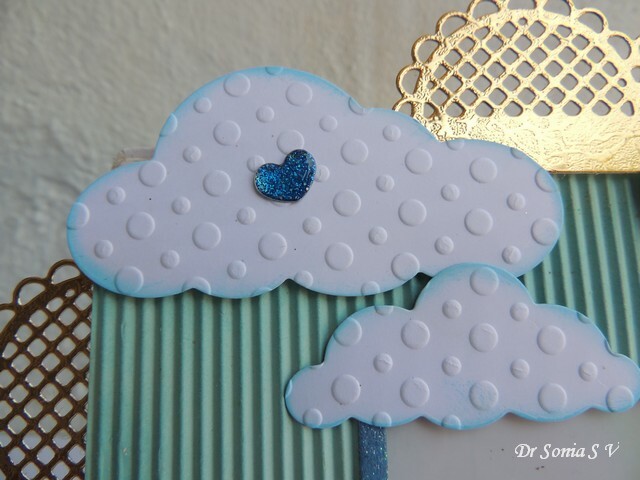 I embossed the clouds and gave them a bit of blue over the edges and added a blue glittery heart just to up to cuteness! 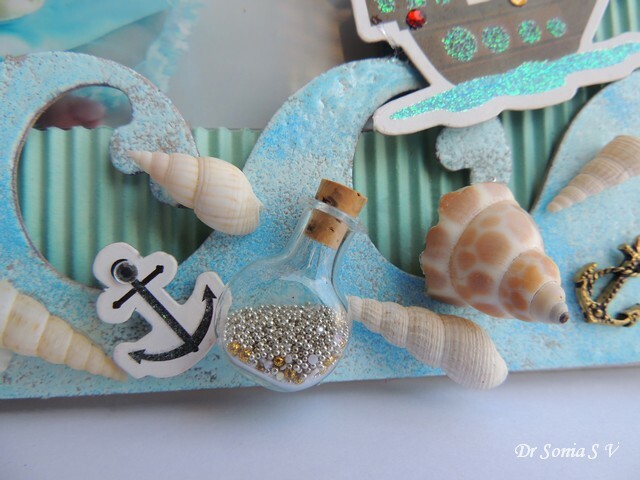 I filled the tiny bottle with glitter balls and chunky glitter and my daughter really went "ooh so cute" over it ! 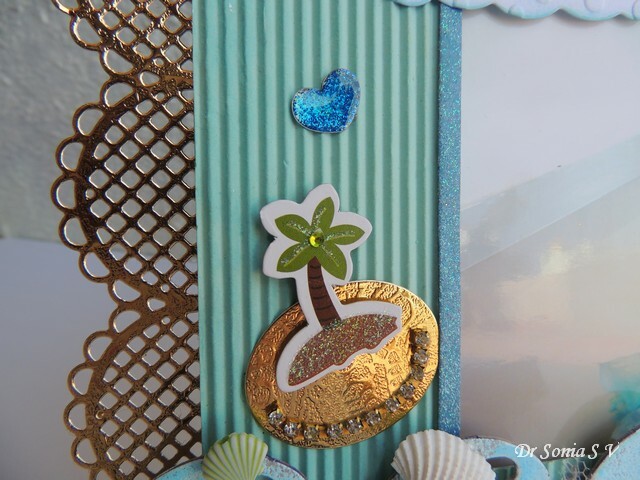 I am a sticker girl cant resist buying cute stickers !Layered the palm tree on a golden island encrusted with diamonds!! 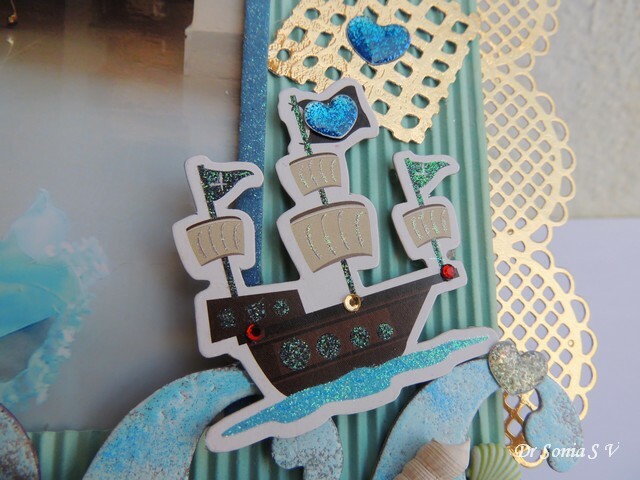 The ship had a pirate sign on the flag but I wanted cuteness so hid it with a glitter heart! 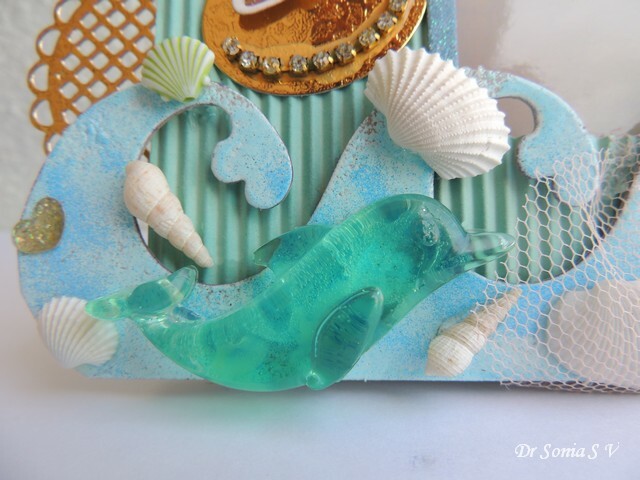 I love this dolphin I created using resin, alcohol ink and a chocolate mold!! 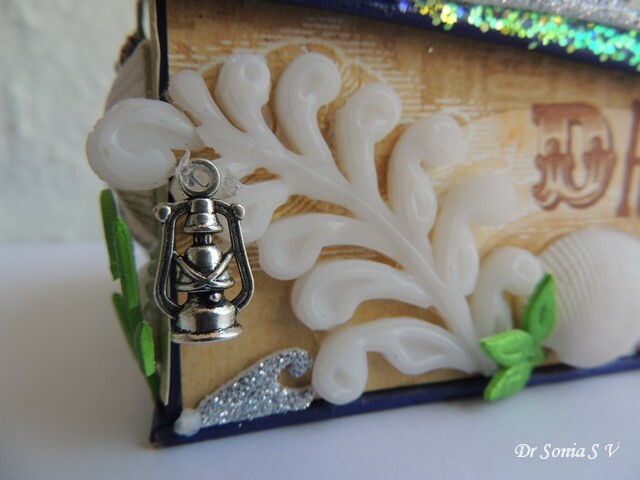 And here is one more view of how the light shines through the little dolphin! 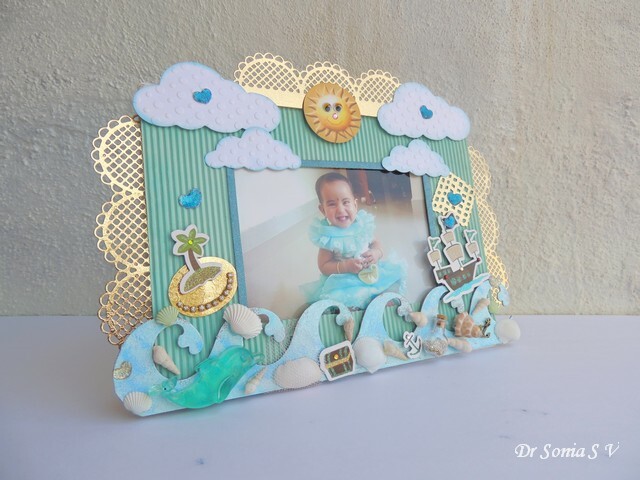 I hope you enjoyed my handmade Photo frame! Halloween Holder Trick or Treat !